You don’t need to move into a new home to know which are the home appliances that you cannot do without. There are products which come in handy to make your life easier. You can purchase them whenever you feel like modernizing your home or when they might become necessary to your lifestyle. There are also the products you need to purchase for the beginning, to keep your home cool, your house fresh and your laundry clean. Let’s explore some of the best home appliances you should already own and how to purchase each of them! Home appliances are the electrical or mechanical machines which perform household-related functions. They are divided into three categories which differ by size, usage and maintenance. Here are some examples. Major appliances or white goods: Air conditioning systems, dryers, dishwashers, fridges and freezers, kitchen stoves, washing machines, water heaters, microwave options and others. Small appliances or consumer electronics or brown (wooden) goods: Kitchen products (juicers, mixers, coffee or herb grinders, waffle irons, coffee makers, toasters), entertainment and information products (TV sets, CDs, DVD players, VCRs, clocks, computers, video game consoles, telephones. The above list contains at least seven appliances that no home can be functional without. Even though you already own some of them, you will still need to change them at least once in a lifetime. Purchasing the best home appliances is usually an issue, as few are up-to-date with the most recent and quality product releases. Moreover, such a product is only reliable if it best fits your needs. The search for products leads you to a shortlist of appliances which are suitable for your home. You will need to research some more to find the best home appliances for you. To expand your search, you should check out more product reviews which also include customer ratings. Don’t focus only on your products. See comparisons, differences, facts about the brands that produce them. Such information that might even change your mind about some products. Product reviews show objective facts about products, which usually include pros and cons also. You can see if you’re comfortable with the appliance’s downsides and how its benefits work for you. Reviews provide you with an insight on the product’s durability, usage, repair, and maintenance. You might also find storage tips for your specific product or learn how to check its quality. Reviews also contain the technical know-how of a product category, as well as additional information about how the product affects your electricity bills and specs about its efficiency. Site and customer reviews also include information about the package that your product comes in. You might notice label or size changes from customers that have already received their products. Usually, reviews contain more products grouped in charts by criteria such as user rankings, range of options, suitability with other appliances, child or animal safety. If you have skin or hair conditions or other related sensitivities, you might find some key information in reviews. The best dishwasher for your kitchen is the Compact Countertop model developed by hOmeLabs. Such a product is extremely useful thanks to its small size and portability. The product comes with a stainless-steel interior which fits any home kitchen and is practical for small apartments. You can wash dishes in the 6-place setting rack and use a silverware basket. Imagine having a toaster oven which works based on infrared heating and cooking to make sure your food is overall completed. 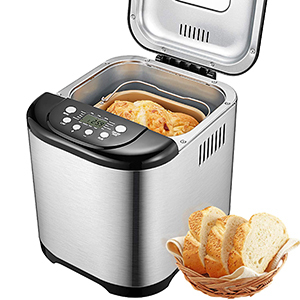 Such an appliance works for toast, pizza, waffle, quick dishes and much more. The toaster oven has a temperature setting which works as a thermal sensor to notify you of the meal’s temperature. A washing machine must be efficient above all. It should wash a lot of laundry while saving you space in the bathroom. Therefore, the Speed Queen 26-inch washer is among the top preferences of Amazon buyers. Such a product has a medium to large capacity, top load option, and a stainless-steel drum. The product comes in white and is distributed by Humphrey Appliance. The best-selling air conditioner is window mounted and yet it has a compact design. The 7-speed product can heat up a room of up to 150 square feet and has a heavy duty of 5,000 BTUs. This product is developed by hOmeLabs. Such a conditioner contains a washable filter and side panel leaves cover. According to its manufacturers, the product is ideal for a window with 23” – 36” length and a height of 13”. Refrigerators should offer generous food storage space while allowing you to store any food, fruit, and vegetable – and freeze some dishes. The Kenmore side-by-side refrigerator also includes water and ice dispensers. Manufacturers ensure delivery, unboxing, and product hookup. The refrigerator covers 25 cubic feet with adjustable and easy-to-maintain shelves. You may consider other appliances once you’ve covered the basics. There are plenty of home appliances to choose from and even more, chances to find the best for your needs. However, additional and modern home appliances make your household tasks easier, while the above appliances are necessary for basic needs, such as food, having clean clothes and laundry and cooking. The best home appliances are the ones that last long, fit your preferences, provide you with all-time performance and almost help you recommend them to others. Find the best home appliances and use them to the fullest! Jenn, thanks! And thanks for sharing your great posts every week!